Bear Trail Lodge sits on 27 acres and is surrounded by state forest, plenty of trails for snowmobiling - ATV - Horseback or hiking the susquehannock Trail, Bear Trail Lodge has 6000 square feet of living space and 2000 square feet of outside deck space, Bear Trail Lodge is a handcrafted build log cabin that is a piece of art build in 2009, has 5 bedrooms a great room with stone fireplace, satellite 55'' TV and build in surround sound system to listen to your favorite music. The house is completely stock furnished with everything you will need including linens, etc. 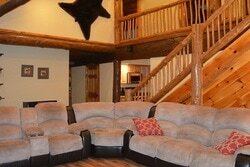 even firewood so your entire family or group can relax in comfort. Bear Trail Lodge is only 15 minutes from Cherry Springs State Park which is a very popular place for star gazing, 20 minutes from Coudersport; or come and fish the native trout streams; Sinnemahoning state park to see the Pa Elk; Ski Denton for skiing; golf at the Coudersport Golf Club; visit Lyman Run State Park..